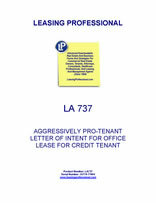 This letter of intent is for the lease of an entire office building to a single tenant, and is pro-tenant in tone. It is designed to be presented to the office landlord by the tenant's broker. It contemplates that the landlord will deliver the premises to the tenant following the completion of modest tenant improvements to the building, which are detailed on an exhibit to the letter of intent. Apart from such specified improvements, the premises are to be delivered in as-is condition. Following acceptance by the landlord, it will serve as the basis for drafting the office lease. Numerous other terms and conditions designed to be incorporated into the lease are included in this letter of intent. They include a rental during the initial term subject to annual rent bumps, and several renewal options at prevailing fair market rentals. The precise method of calculation of market rent is covered by a detailed exhibit to the letter of intent. Additional issues included in the letter of intent are brokerage commissions, parking, antenna and rooftop equipment, signage, landlord default, subsequent improvements, and moving expenses, among others.